Ideal substrate for all types of reptiles, amphobians, small animals or insects. Compressed brick will expand to make 7-8 liters of substrate. 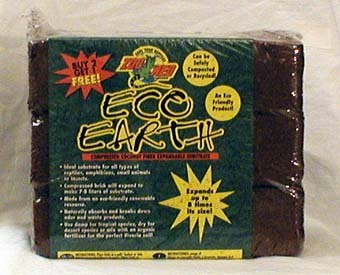 Made from an eco-friendly renewable resource. Naturally absorbs and breaks down order and waste products. Use damp for tropical species, dry for desert species or mix with an organic fertilizer for the perfect Vivaria soil! Expands up to 8 times its size!